PLEASE NOTE: Our new tasting salon located inside V Marketplace is now open. Join us for tastings 10:00am-6:00pm daily. Hosted at our new tasting salon located inside the historic V Marketplace in Yountville, sample four of our current release wines while learning about our sustainable farming and winemaking practices. Walk-ins are welcome. Groups larger than 6: reservations required; please inquire for tasting options and pricing. Join us for a seated tasting of Chiarello Family Vineyards wines. This intimate tasting is hosted at our tasting salon located inside V Marketplace, and is accompanied by a pairing of housemade charcuterie and local cheeses to complement the wines. Available by advance appointment for parties of 2-8. 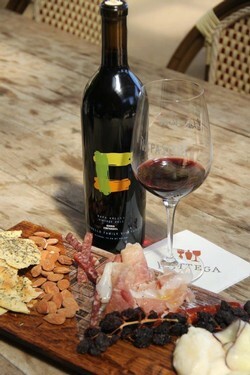 To reserve the Antipasti Tasting, please call or email us at (707) 220-8307 or wines@chiarellovineyards.com.